Telehealth, or telemedicine as it is also known, is exploding in the US and worldwide. In 2013, fewer than 350,000 patients used telehealth services, but by 2018 that number is expected to be 7 million a 19% increase in only 5 years. This number is supported by the estimate that some 75% of patients are comfortable communicating with their doctors using technology instead of face-to-face office visits, and they value access to healthcare more than they do personal interaction with their doctors. Patients experience more convenient, accessible healthcare. Providers are noticing improved outcomes, fewer hospital re-admissions, and more profitable practices. Employers have healthier, more productive employees and decreased health benefit costs. If you are a primary care provider, mental health professional, or employer and you’re ready to offer telemedicine to your patients or employees, HealthCore Services is here to help. We have successfully implemented HealthCoreMD, our secure, cloud-based, HIPAA-compliant telehealth solution for both providers and employers. There is no software required or expensive equipment to maintain – only a compatible video and audio device and an internet connection. 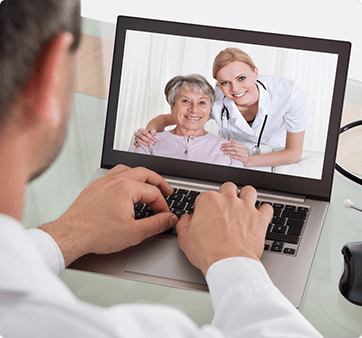 Provider-patient consultations are conducted using high definition videoconferencing accessible from a PC, laptop, or mobile device. Employers may also choose to offer telehealth kiosks at their workplace. HealthCoreMD for providers features electronic prescribing software, integration with EMR systems, exportable medical charts to facilitate reimbursement, and a mobile app. Within each local market, HealthCore can connect area providers with area employers. This offers employers and employees the peace of mind that they are receiving quality care from providers who are active in their community, and who they can go see for an in-person visit should they choose to do so. To learn more about the advantage our telehealth solutions have to offer your patients or workforce, call (866) 569-5622 toll free for a consultation today.